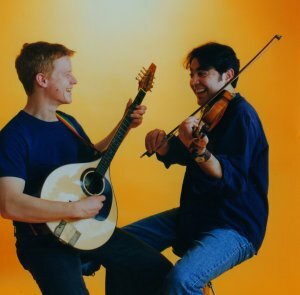 Paul Sartin and Benji Kirkpatrick have been instrumental in the English music revival of the last ten years, and have worked together in a number of capacities since they first met in 1996, in both the UK and Europe . As a duo they have performed at festivals and clubs, and facilitated workshops for many community projects in schools, old people's homes and prisons under the auspices of music charity Live Music Now. They are both members of the acclaimed big band Bellowhead (Best Live Act, BBC Radio Folk 2 Awards 2005), and innovative trio Faustus with Saul Rose (Waterson:Carthy, Kings of Calicutt). Paul Sartin is a hugely versatile musician counting Belshazzars Feast and Christchurch Cathedral Choir as well as Dr Faustus amongst his past ‘bands’! As well as working with Faustus he is an integral part of bellowhead lending oboe, fiddle, vocals and his inimitable ‘jazz mc’ technique and dress sense to the group. Having studied as Choral Scholar at Oxford , Paul completed a Masters degree in traditional music at Newcastle University in 2005, and is engaged in academic work, research and teaching. He plays with Paul Hutchinson in the English traditional duo The 2 Pauls, has sung extensively in English choral music, most notably in the cathedrals of Oxford and Winchester , and conducts the Andover Museum Loft Singers. Benji Kirkpatrick: Guitar, bouzouki and vocals Well-known as a soloist and with two solo albums under his belt, Benji has recently been working with Seth Lakeman (Nationwide Mercury Prize Nominee 2005). He has performed and recorded alongside such luminaries as the Oysterband, Eliza Carthy, Cara Dillon and Jim Moray. Having studied performing arts at college, he has worked with West Midlands based touring company Pentabus, as well as composing the music for Tim Plester’s stage western Yellow Longhair in 2000.